POLKA DOT PARK – Road to House on the Waterfront Weekender starts here !! 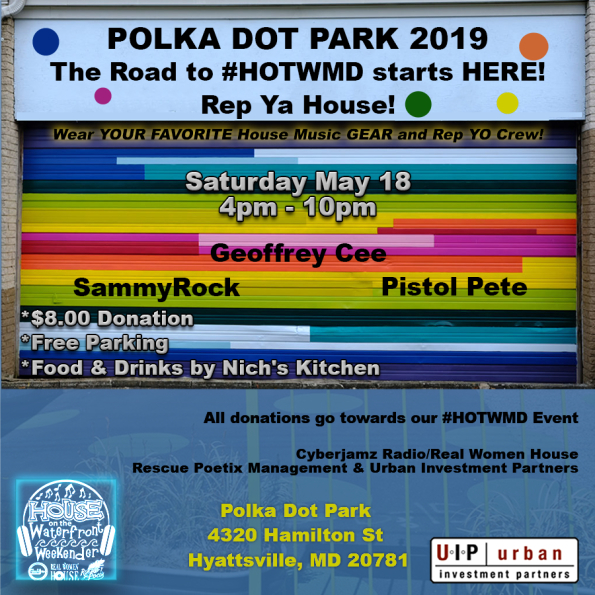 It’s that time again and we are back at our favorite hang out spot in Hyattsville, MD, Polka Dot Park.Check in Saturday May 18,2019 for our first opening edition featuring Bmore’s own Geoffrey Cee ,Pistol Pete Sierra and yours truly SammyRock aka Soul Oasis of Cyberjamz Radio/Records.It’s going to be one for the books ! As many of you know we love our theme events and this one is without exception as we would like you all to REP YA HOUSE by wearing your favorite house gear! 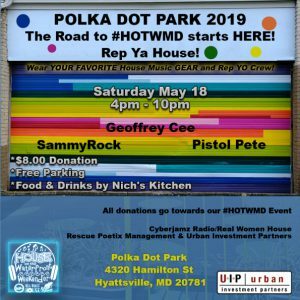 This is our last summer at Polka Dot Park because they are starting construction in the Fall of 2019,so help us toast the place where we held our past events entitled “Vinyl and Vittles”, “The Play Date” and “Beats and Bandanas” which were all slammin events. * $8 bucks donation will get you in, and it helps us offset the costs of our upcoming #HOTWMD Weekender in August. Stay connected and let us know if you planning on attending – God Willing.